In 1925, Arctic prospector Jack McCann becomes a rich man when he strikes gold but 20 years later he faces major personal and family problems. A tale of power, passion and obsession set in a politically torn Eastern European country. Middle-aged Gerald Kingsland advertises in a London paper for a female companion to spend a year with him on a desert island. Richer than Getty, stranger than Hughes, the bizarre tale of Jack McCann. Tracy: [testifying] I loved my father before I loved you. Claude Maillot Van Horn: Was he more violent than me? Tracy: Stop asking me about violence! Claude Maillot Van Horn: Your father was savagely murdered, beaten, his head cut off. I'm on trial for my life. If I'm found guilty they'll hang me by the neck. This isn't a time or place to be shy about violence. Eureka is an undertaking where the director has a vision and, against all odds, follows it through.The downside was the woeful distribution of the film on completion, resulting in lack of audience participation due to a delayed release and scant showings (it played in just two London cinemas); just goes to show that certain distribution companies are flummoxed when they have a unique picture to promote. 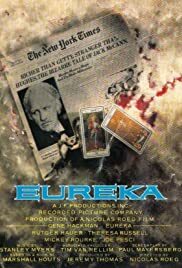 Eureka boasts a great across-the-boards cast, with Gene Hackman giving his customary all in a driven and committed performance, ably supported by Theresa Russell, Rutger Hauer, Joe Pesci and in a minor role, Mickey Rourke. 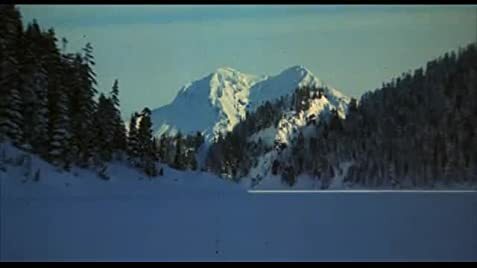 Director Roeg's use of locations, his skill in cutting, the harnessing of atmosphere and the adroit use of music add up to an intriguing whole, loosely based on fact. It was made at the start of the 80's after an astonishing run of films by Roeg. Actually, this is a very quirky film, immersed in other things; in this case it is the Kabbalah. (This is made clear when Rutger Hauer wears a shirt with the Tree of the Kabbalah drawn on the front to a formal dinner in the middle of the film.) I found this release of the film both impressive and a let-down. It is impressive because of its ambition as a film; it is a let-down because (the way it is edited) most sense of "suspense" is replaced by puzzlement; this is The Zohar meeting Hollywood and suffering from the meeting. In the end, I don't feel this movie has any grand message for the world, except perhaps the pointlessness of having so much wealth if you don't do anything with it. Overall rating: 7 out of 10.